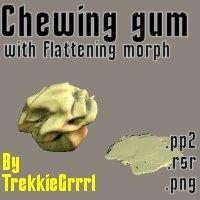 A lump of chewing gum. Can be flattened. It can also double as a wad of paper. Eeeewww, perfect! Thank you for your unusual props! Does it lose its flavor on the bedpost overnight?